Okay, it’s best if I get this out of the way immediately: this book is a total mindf*ck. There, I said it. I know that may be an uncomfortable proclamation for some but there it is. This is the best way for me to describe this book. It is really good…like, really, really good. So creative, dark, gripping, it wraps you up in this world of Cordova and has you second guessing even yourself. Who is Cordova? In this story Cordova is an uber-famous film director; mysterious and untouchable – he is the shadow that looms over this entire book. Our protagonist, Scott McGrath, is a fallen from grace investigative reporter who becomes fixated on investigating the apparent suicide of Cordova’s daughter Ashley. Through the course of his investigation he becomes involved with two young people, Nora and Hopper, who aide him in his investigation. The story incorporates mixed media sources such as past magazine interviews and articles, online forum posts, etc., which makes you feel as though you too are part of the investigation. The entire book blends the line between fantasy and reality and the idea of what your mind can come to accept as truth even without definitive proof. I don’t even know if I am making sense right now but this book will do that to you! I listened to this book on audio and the narrator was absolutely perfect. His voice was Scott McGrath. The dialogue was so smart, I laughed out loud, I exclaimed curses when really scary stuff went down – I must have looked mad driving my car down the highway. I would highly recommend this book to anyone who enjoys a dark story steeped in occultism and mystery. My rating of 4.5 versus 5-stars is because the ending didn’t quite work for me. I don’t want to say I was disappointed with the ending, I just wish certain elements of it had gone differently. Overall, this is a fabulous examination of the human psyche and a sick, spooky read! Rating: 3.5-stars: This was a good book. A fun, fast-paced, easy read. I made the mistake of reading some Goodreads reviews before I started it, which I generally try to avoid, and kept waiting for the terribleness to set it. It didn’t for me. I had a great time reading this. Granted I didn’t go into it expecting Pulitzer Prize for Fiction quality so maybe that helped. This story is a retelling of the fairy tale of Rapunzel. In this very dark world, where an eclipse of the sun has darkened the land for almost two decades, we meet Luna, now 17-years old, having lived in the tower since the day of her birth. She is sweet and innocent and obviously dreams of the world outside her tower walls. There is a boy, Fowler, who ends up at the tower and yes, there is instalove on her part. In some reviews people were quite negative on the instalove but I say in this case, it actually kind of works. I mean, the girl has legit been locked in a tower her entire life with only the two adults who have raised her for human interaction. I do not find it surprising or cliche that when a young man her age finally comes into her life she would be instantly attached to him. I mean, when I was 17, I could see a guy for 2-minutes and be smitten and I certainly didn’t grow up in a tower. The action really picks up when Luna and Fowler are forced to leave the tower and try to make their way to the island of Allu where they anticipate safety. This world is really scary, dangerous and literally dark so they come to rely on one another and over their long journey do grow to love one another. The book left off on an amazing cliff hanger and I am excited to start the second book. So, in conclusion (hehehe), was this book perfect? No. Were there parts I rolled my eyes at slightly or noted that the author had used the same exact phrasing in previous paragraphs? Sure. Did I have a heck of good time reading it? Yes. 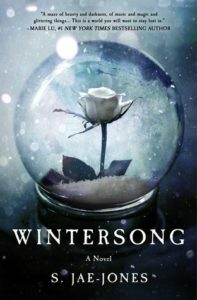 If you are looking for a dark fairy tale retelling that you can read quickly and just forget about life for a while, I would definitely recommend this book! TGIF Bookworld! I haven’t written anything in a while – I guess I have been feeling uninspired this week. I just wanted to give a general status update today for my current reads. Right now I am currently reading 7 books. 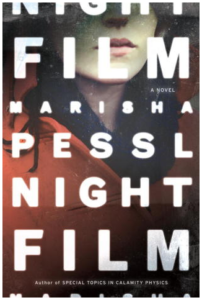 First up is my audiobook, Night Film by Marisha Pessl. I first learned about this book through booktube. I recently went on a long (8 hours round-trip) road trip and thought it would be the perfect book for that and it totally was! The book in its entirety though is over 20-hours so I am still working on it. The story is very dark, very creepy and involves some mixed media, such as emails, newspaper & magazine articles as well as online forum posts. The protagonist is an fallen-from-grace investigative reporter who starts looking into the apparent suicide of the daughter of an uber-famous and mysterious film director. I can’t even begin to describe more of the book than this. It is so brilliant, laugh out loud funny at times, jump out of your seat in fright at times, never-ending mind f*ck. I am absolutely loving it! Next up, I have two ARCs I am currently working on. MacBeth by Jo Nesbo is part of the Hogarth Shakespeare series and is a modern day retelling of…you guessed it, MacBeth. This version of the story takes place in the 1970s in a city in Norway teeming with crime, drugs and corruption. As expected, ambition is the theme of day with this one. So far so good, it is very long but very well done. I strongly anticipate between a 4 and 5 star review with this one. This book is set to be released on April 5, 2018. 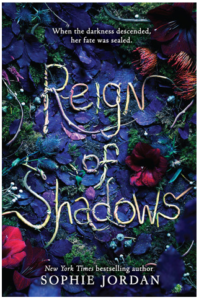 The next ARC, I just started last night so am not too far into yet, is The Ace of Shades by Amanda Foody. Right now it looks like this is going to be the first book in a YA-series set in the fictional city of New Reynes, dubbed the City of Sin of apparently very similar to our Las Vegas. This story follows our main character, Enne Salta, as she travels to the city of New Reynes to investigate the disappearance of her mother, Lourdes. She has very little to go on and pairs up with a young, well-known and well-connected card dealer and gang member, Levi Glaiyser. The expected publication date for this one is April 10th by Harlequin Teen. My current non-fiction read is (STILL) Team of Rivals: The Political Genius of Abraham Lincoln by Doris Kearns Goodwin. I have been reading this book since last Fall. It is a big one and a dense one and there are days I feel like I will seriously never finish it! When I am reading it, I am enjoying it and learning soooo much but at over 900-pages it is no surprise that this has turned into a 6-month labor of love! Next, I am continuing on with two series. The first of which is The Dark Tower series by Stephen King. I am on the 4th book now, Wizard & Glass which is significantly different from the first 3 of the series. In this book, we are getting mostly backstory on Roland of Gilead, which is fantastic as he is such a mysterious and layered character! I love learning more about his earlier life in another place and another when. I have chosen to read this entire series back-to-back as it is so detailed, I am afraid I would forget great swathes of information if I were to take time off in between the books. At this point, I am ball-parking having this series completed by June 1st. The next series continuation for me is the third book in the Throne of Glass series by Sarah J. Maas. This is a YA-high fantasy series following the kickass female protagonist, Celaena Sardothian. This book, Heir of Fire, is proving to be just as exciting as the first 2, dropping us off pretty much right where book 2 left off. Currently, there are 6-books, plus a prequel in this series, with a 7th book due to be released this Fall! I am hoping to complete this series prior to the new book release so I can read it as soon as it comes out. So far with this series, I have been taking a 1-book break in between the books before moving on which seems to be working for me. The last of my current reads is, Foolish Hearts by Emma Mills. This is a fantastic YA-contemporary that I received in my OwlCrate book box a couple of months ago. This story follows high schooler, Claudia, as she navigates the ups and downs of her senior year in high school. Central to this plot is a high school production of A Midsummer’s Night Dream! The dialogue is so witty and frankly, downright hilarious, I am absolutely loving this book! In other news, I received my first bullet journal today so I am looking forward to jumping on that train! I have been seeing them all over booktube and finally couldn’t resist. I am planning to use it to track my monthly reading goals, hauls, wrap-ups, etc. Have you read any of the books that I am currently reading? Happy to hear your thoughts on any of them in the comments below! I couldn’t decide between a 3.5 or a 4-star rating for this book so decided to round up to 4 for Goodreads rating purposes. 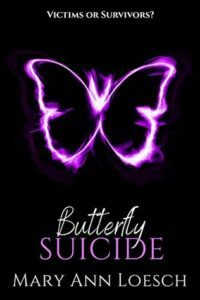 Butterfly Suicide is a fairly heavy YA contemporary dealing with topical issues such as violence at school, bullying, marital discord, adultery and sibling abuse. The story takes place in a rural town in Texas and follows the perspective of two characters in the aftermath of a school shooting. The first is Stephen, the brother of the shooter. The second is Monica, the sister of one of the victims, the shooters ex-girlfriend. The story picks up a few months after the actual shooting and deals mostly with how the family members of such tragic events deal with the consequences of those events – picking the pieces of their lives up and trying to put them back together. Stephen and Monica develop a relationship and obviously there are a lot of problems that arise due to that. There were some issues with the plot, some details I didn’t find that believable and that they were put in more for convenience to move the story along. It was fairly well written though – especially the character of Stephen – I felt the chapters from his perspective were particularly strong. Monica fell a little flat for me – she didn’t have the depth of character that Stephen had in my opinion. 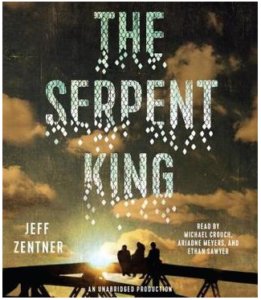 Overall, it was a compelling read and the ideas behind the story are important to explore – although not perfect, a very solid piece of YA fiction. I want to thank the publisher for providing me with a copy of this book in exchange for an honest review. Stunning – 5-stars – I loved this book. For pretty much the entire book I was thinking I would be giving this one a 4-stars (which is a great rating, it means, I really liked a book) but then I reached the last portion of the story and it stripped my breath from me. So enchanting, so beautiful, so heartbreaking. I will admit that the first 50 to 70 pages of the book, I really wasn’t sure what to think; if I liked it, didn’t like it, what was going on, how the heck do I pronounce these names…but eventually, with a little patience, it started to weave together the most intricate, spellbinding story of forbidden love I have ever read. Perhaps it makes sense to view it as a musical composition, timid at first as the story begins to unfold, solid and constant through the middle then a crescendo as we rush towards our ultimate conclusion. 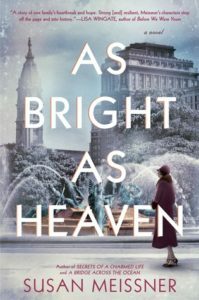 I do not read a lot of books with a strong romance element, and this story is definitely all about the romance, but this one touched me deeply. I was surprised by how quickly it turned steamy actually and believe I even blushed once or twice! The love between Elisabeth and her Goblin King is somehow fractious, violent and childish all at the same time. Their connection is so tangible, I felt it in my heart; the ups and downs of their lustful and rough coming together. The musical elements of the story were beautiful – they bring it alive – if this were to be turned into a movie, I believe it would have an absolutely revolutionary soundtrack! Overall, I felt drawn into the story, slowly but surely and once I was in, I was in, entire. I cannot wait to read the next book of the series which is titled Shadowsong and was released on February 6, 2018. I actually received a free copy of Shadowsong from the publisher in exchange for an honest review – so, time to get start! Wow, okay, this was a really fun read. A Book of the Month Club pick for July 2017, I am actually sad I waited this long to get to it (damn you, never-ending tbr list!). 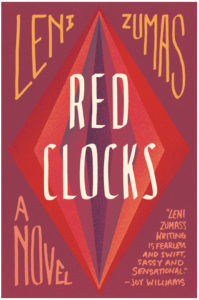 I am giving this four stars instead of five because I usually only give five stars to books that I would read again and I don’t think I would reread this one. The story for this is definitely one where it is most impactful the first time through. The structure and storyline reminded me of a B-rate Horror flick and I do not mean that as an insult. I am a person who has sought out the best B-rate horror films my whole life- I love them. I feel this book would translate well into a movie actually. It starts much like many of those movies start, a group of super attractive college kids head off campus for a weekend celebration in the woods at a creepy little cabin…well, you can imagine the rest. Picture Cabin Fever, directed by the insanely talented Eli Roth, but witnessed through flashbacks. So fun, right?! The beginning of the book was a little slow for me but about half way through the chapters started to get shorter and the flashbacks more frequent as you begin to piece together what the hell is actually going on. You think you know what is happening, you think it is predictable, but then that all gets flipped on its head and the ending was absolutely fabulous. 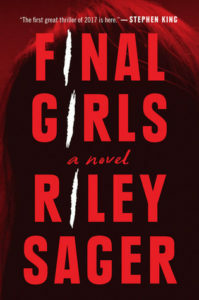 Overall, I think this was very well done and I definitely want to read the book Riley Sager is set to release later this year, Last Time I Lied – if it is anything as good as this, I know it will be a wild ride! Excellent – a rollicking, fun ride to the edge of the earth and back! The story of Billy Gawronski is one that I had never heard before but I feel like now, it will be one that I never forget. A true tale of perseverance and adventure. Young Billy dreamed of traveling to far off places and saw his dreams become a reality when the infamous Admiral Byrd planned an excursion from NYC, where Billy lived with his immigrant parents, to the last unknown frontier of Antarctica. 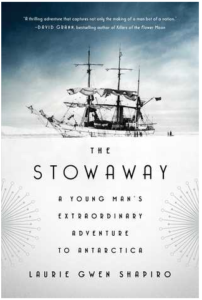 Billy was willing to do anything to be a part of this expedition – including stowing away – which is exactly what he did. This book takes us on a journey to the far reaches of the earth filling in history, geography and science along the way. This is actually a fairly quick read for a nonfiction book – not as dense as many tend to be. Because of this fact, I would think this would be a great book for YA-readers, as well as adults. The Author’s Note at the end sealed the 5-star review from me. If you read this book – make sure you read all the way through. I would like to thank the publisher, Simon & Schuster, for providing me with the opportunity to read and share my thoughts on this amazing story! If you love true tales of adventure I would highly recommend picking this one up!